Dhaka, April 15 (newsin.asia): Bangladesh’s economy is now growing at a phenomenal 8.15%. And the growth is shared by the poor of the country too, says the Bangladeshi Minister of Information, Dr.Hasan Mahmud. “Ten years ago, 40% of Bangladesh’s population was living below the poverty line. Today it has come down to 20%. This means that the benefits of economic growth are trickling down to the poor,” Mahmud said addressing visiting foreign journalists from 26 countries and five continents here on Monday. Attributing the growth achieved in the 10 years to the dynamic leadership of Prime Minister Sheikh Hasina, the Information Minister said that the achievement has been all the remarkable because the country had had an unenviable start. “The liberation war had claimed three million lives and the modesty of 200,000 women had been violated. In 2008, when Sheikh Hasina won the elections, the per capita income of the country was US$ 600 but ten years down the line it is US$ 2000. The economy is growing at a faster rate than India and Pakistan. Thought to be basked case for years after its birth in 1971, Bangladesh is no longer a Least Developed Country. It is a a developing country. Mahmud pointed out that Bangladesh has graduated from being a food importing country to a food exporting country.It is the fourth in the world in sweet water fish, vegetable and potato production. It exports fish ,vegetables and potato. The garment sector has proved to be robust and is now competing with China. “ The US withdrew the GSP concession and it was thought that garment excports to the US will fall. But export went up,” Mahmud noted. Asked by a correspondent if with increased borrowing from China on commercial terms will get Bangladesh into a debt trap, Mahmud said that Bangladesh has a record of keeping its repayment commitments. The Minister further said that Bangladesh is not tied to any one country. “We welcome investments from all countries. Any country wishing to invest in Bangladesh will be welcomed,” he added. 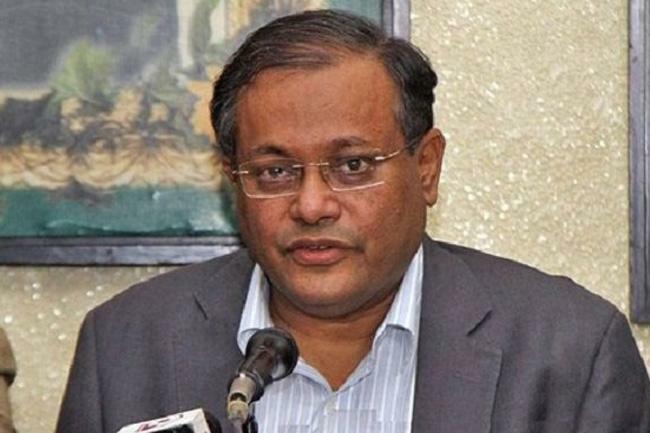 Indicating that the financial condition of Bangladesh is strong, the Minister said that now 92% of the budget is funded internally. Previously it was 70%. Ten years back it was 50%. The minister pointed out that remittances from the 10 million Bangladeshis working abroad have been of great help. On corruption, Mahmud said that ten years ago Bangladesh was performing very poorly as per the Transparency International. “It was a champion in corruption. But now the rating has improved. Sheikh Hasina had set up the Anti-Corruption Commisson, an independent body which even hauls up people even in the government and files cases,” he said. On democracy and press freedom, Mahmud said that press freedom is complete in Bangladesh and it is reflected in the phenomenal growth in the number of media outlets during Sheikh Hasina’s rule. “It was in 1996, during her first tenure that private TV channels were allowed.Today there are 33 TV channels. The media gives more coverage to the opposition than to the ruling party,” he pointed out. Sheikh Hasina is friend of the press Mahmud said, pointing out the government is planning to set up a Journalists’ Welfare Fund to help them in times of need. On democracy he said that Sheikh Hasina was the first to set up parliamentaryh committees in which the chairperson is an MP and not the subject minister. On the treatment of minority communities, Hindu ,Christian and Buddhist, Mahmud said that “secularism” is central to the ruling Awami League’s creed. “This distingusishes the Awami League from the opposition.For the Awami League, Bengali and not religion which comes first,” he said. On the Rohingya question, Mahmud said that the Myanmar government has indicated quite clearly that it is not prepared to take any steps to take back the Rohingya refugees. He said that Organization of Islamic Countries should do more in this regard. Since Bangladesh’ tourist destinations are in the area in which the Rohingyas have been accommodated, tourism has suffered. Mahmud said that Bangladesh is suffering from climate change though it is not at all responsible for it. There is a danger that 17% of the coastline might go under water during rising sea levels in the near future.